All requests for media credentials for RGV Barracudas games – either for a full season or individual games – must be submitted in electronic form at least three days in advance of a given game. Fill out the form at the bottom of the page. Please submit the information provided above, as well as the date or dates being requested. All requests will be reviewed on an individual event basis. This also applies to visiting teams as well. Please send requests and include the information provided above, as well as the URL of the website you write for. All requests will be reviewed on an individual basis. 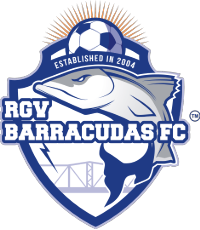 Fan sites will be monitored, and credentials can be revoked at the discretion of the Rio Grande Valley Barracudas. All still or digital photography/video and audio media are also required to complete the form on the bottom. All media requests should be emailed to Reynaldo Silva at rey.silva@barracudasfc.com no later than 72 hours prior to the event. Upon approval, you will be notified where and when you may pick up your credentials and associated information. To be accredited, media must work for legitimate, verifiable, news-gathering or producing organizations. Membership in a writer's or broadcaster's association does not automatically qualify an agency or individual for credentials. Only if requesting a single game credential.